Find twelve words from The Owl and the Pussycat at the Word Search Activity Page. You can print the word search and check your answers, too. The Owl and the Pussycat is a nonsense poem. At Poetry for Kids you can read lots of silly poems that will make you smile and laugh. The Cat Logic Activity Page has word problems that really make you think. Use your mind to concentrate. Try to choose the right answer to complete each sentence. Look closely at the pages of the book. There is a tiny sea horse that swims beneath the pea-green boat. Did you know that the male sea horse carries babies in his pouch? To learn more about these amazing fish visit NOVA Online/Kingdom of the Sea horse. At the American Museum of Natural History's Online Field Journal, you can compare sea shells. Write your ideas on paper. Then share your thoughts with your teacher and friends. Around the globe, people say "cat" in different ways. Go to The World of Cats Activity Page to practice saying "cat" in other languages. Edward Lear was a poet and an artist. He wrote The Owl and the Pussycat as a nonsense song for young children in the 1800's. 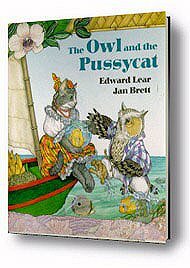 You can read about his life and his work at the Edward Lear Home Page. Cats are the world's most favorite pet. Visit the Cats! Wild to Mild site at the Natural History Museum of Los Angeles County to learn the history of our feline friends. Can you name any machines used to explore the deep parts of our world's oceans? The "Bathysphere" was the first Deep Sea Machine. Recently, the "Nautile" recovered artifacts from a famous sunken ship, the Titanic. Look at photos as you read information about Deep Sea Machines of the past and present. Print Jan Brett's Coloring Page with the owl and the pussycat, tropical flowers, a sea horse and more.